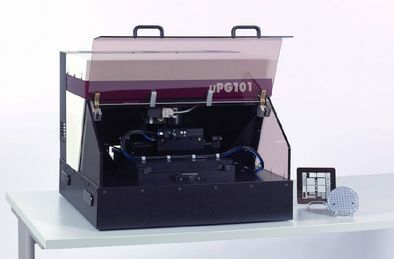 A screencast of the PC attached to the MicroPG 101 is available by going to https://coral.nanofab.utah.edu/lab/snapshots/see/Heidelberg%20MicroPG%20101. Consult with Nanofab staff regarding microfabrication process flow and mask design. • Keep in mind that defined areas will be exposed. • Do not use special characters (spaces, punctuation marks, umlauts ..) in the design name. • The design coordinate origin must be the center of the design. • If possible, create the whole design in only one layer. If several layers are used, they will be merged using an OR function. • All polylines must be closed. Keep in mind that interiors of polyline structures will be filled out completely, covering any structures within. • Do not cross polylines, or create doubled vertices (vertices with no distance between them). This will create data errors. • Do not use single lines without width. • Use a 100% AutoCAD compatible editor. • The design has to be created in metrical units. • As far as possible, only use the structure types "polyline", "circle", and "text". • Only one text font is provided. This will replace any other font used in the design creation. The only supported text attributes are "rotated", "mirrored", and "scaled". • Try to use as few layers as possible. All layers will be merged via an OR operation. • Do not use special characters in the layer names. • Polylines with width must not change their width (tapered lines). • When inserting blocks, the same scaling has to be used for x and y. • External blocks are not supported. • Maximum image file size is 4 GB. • For grayscale exposures, use 8-bit format. The 256 gray values will be interpolated down to 100 gray values. • Create the design in a 90° counter-clockwise rotated version, as the design will be rotated 90° clockwise during data processing. • Use only one layer. If several layers exist in a design file, only the layer with the most references will be written. • Maximum definition or reference depth is 50. • The subroutine with the highest number definition will be taken as main routine.